Coconut Lime Crispy Chicken was made one fine evening when I was craving for something nice and crispy, but my mind kept telling me to eat healthy. I was about to succumb to the evil deep fried stuff when I chanced upon this awesome recipe and decided to put my Philips airfryer to a good use again. I modified the recipe a bit and used Kaffir Lime leaves to enhance the flavour. So here it is, the chicken I made using Kaffir lime leaves, coated with fresh coconut and breadcrumbs airfryed crisp and crunchy from outside and soft and succulent inside. Needless to say I was happy that evening. Don’t despair if you do not have an airfryer the dish will come out just as good in taste if you deep fry the chicken. Also if you do not have Kaffir lime leaves you can substitute it with Lemon zest, it is not the same but pretty close. Some even suggest using bay leaves but I would not do that. Preheat the airfryer at 180 Degrees for about 3 minutes. Break the eggs add a bit of salt to it, keep the Mix shredded coconut and breadcrumbs in a plate and keep it ready. Dip the marinated each chicken Piece in eggs and roll it in the breadcrumbs coconut mix. Brush the container of airfryer with a bit of oil and arrange the chicken in the tray. Brush it with a bit of oil and set the airfryer to run for about 8 minutes. Check for doneness after 8 minutes (With a fork see if the inside of the chicken has turned white. If it is pink, keep it in the airfryer for some more time). 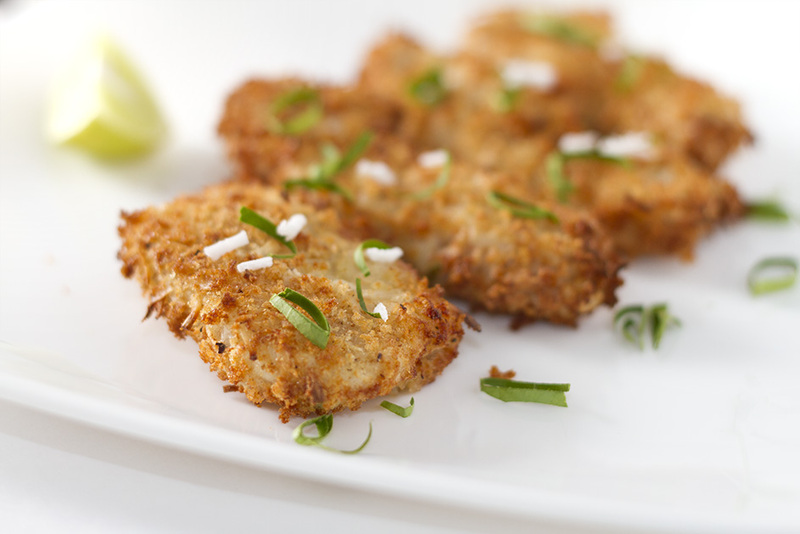 Serve Coconut Lime Crispy Chicken with the sauce/dip/salsa of your liking. Something sweet and tangy goes very well. The kaffir lime (Citrus hystrix), sometimes referred to in English as the makrut lime or Mauritius papeda,is a fruit native to tropical Asia including India, Nepal, Bangladesh, Thailand, Indonesia, Malaysia and the Philippines. It is used in Southeast Asian cuisine and the oil from it is used in perfumery. Makrut lime leaves are used in Vietnamese cuisine with chicken to add fragrance. They are also used when steaming snails to decrease the pungent odor while cooking. The leaves are also used in Indonesian cuisine (especially Balinese cuisine and Javanese cuisine), for foods such as Soto ayam, and are used along with Indonesian bay leaf for chicken and fish. They are also found in Malaysian and Burmese cuisines.